The monitor include a driver board with HDMI, VGA and Composite inputs as well as stereo 4 ohm at 3W output driving capability. The setup is very easy to use - simply connect a 5-12VDC adapter to the 2.1mm center-positive DC jack, then connect a digital video source to one of the ports and two 4 to 8 ohm speakers to the SPK output pins. 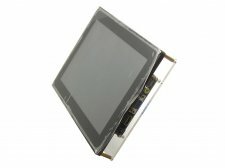 The monitor include HY101CTP display, RTD2660H driver board, Acrylic case, two 8 ohm speakers module.